If you’ve been following Ubisoft over the last few years, you know that they’ve settled into a sort of a cycle for every year. They have a number of major IPs that sell like hot cakes, including the likes of Assassin’s Creed, Far Cry and a large number of Tom Clancy sub-franchises, and most, if not all, of these receive annual releases. 2016, though, was quite unusual for Ubisoft, in that what is arguably their biggest franchise, i.e., Assassin’s Creed, took the year off. However, 2017 promises to be a very big year for Ubisoft. They have already had great success in the recent past with games such as The Division and Ghost Recon: Wildlands, while titles such as The Crew, Watch Dogs 2 and Rainbow Six: Siege have also done very well in their own rights. Ubisoft’s 2017 lineup, though, has the potential to make this year one of the biggest in their history. 2017 will see, first and foremost, the return of Assassin’s Creed, with the release of the recently leaked but as-of-yet still officially unconfirmed Origins. The game looks to be just the breath of fresh air the series needed, taking the story back to its starting point, with changes to the gameplay that seem to be letting go of Ubisoft’s tiresome tower unlocking open world formula and going for the smoother, more nuanced gameplay we seen in games such as The Witcher and Skyrim. We’ve also got Far Cry 5 on our hands- we know for sure that there will be another Far Cry games this year, and fans of the series know why that is cause for excitement. Far Cry 3 and 4 were excellent games in every sense of the word, and made for some of the best open world first person shooter experiences in the history. And while Primal was not quite at the same level, it still did a lot of things right. There are rumours that Far Cry 5 will be a game set in the wild west or Montana, and the prospect of playing something like that is mouth-watering, to say the least. 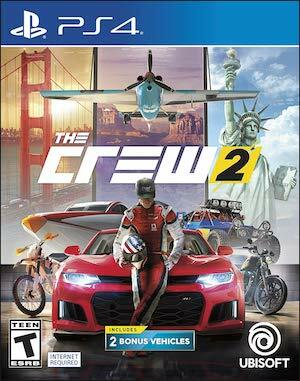 And then there’s The Crew 2. The original Crew failed to live up to the lofty expectations fans had of it, but it still had some neat ideas. Ubisoft have confirmed that they will be releasing a follow up to the racer this year, and while we know nothing about it other than that fact yet, we can be sure, or at least be hopeful, of the fact that Ubisoft will be working hard on improving on The Crew franchise however they can. There’s usually a lot of skepticism surrounding anything to do with Ubisoft these days, and to be fair, they’ve earned a lot of that with their antics. However, if they do things right, which they do indeed have the ability to do, 2017 can truly be one of the best years in their history.